We have to say that we’re impressed - here is a really smart gadget that does exactly what its manufacturer says it will do. And, even better than that, it does something better than we’ve ever seen anything similar doing! So what is it then? Well, at first appearance it looks just like a 10mm LED mounted in a bezel. But then when you look closer you’ll see a tiny pushbutton – and if you pull the assembly from the bezel, you’ll also see a programmable chip and a few other components. In fact, what we have here is a battery monitoring LED that is user-programmable to run one of six different in-built maps. The single LED can show green, red, yellow (a yellow that actually looks more orange to us) and white (off). The LED can also flash at different rates. The voltage is monitored as a rolling average over 2 seconds, is claimed to be accurate to 1 per cent, and will operate over 3.8 – 30V. Wiring is as simple as you can get – red to positive and black to negative (or chassis). That’s it. So what are the different in-built battery monitoring maps that are available? There is one for pretty well every use you can think of. This is the factory default voltage indicator mode. Low distraction, minimum of colour changes in normal operation, suitable for vehicle use, such as motorcycles, cars, boats, campers, etc. By flashing and using different colours, it shows 8 different voltage ranges from 10.5 to 15+ volts. This map illuminates the LED green when under charging conditions, i.e. when the vehicle alternator is working. Yellow and red will show if the battery is discharging. This mode monitors 7 different voltage ranges from 10.5 to 15+ volts. This is great for motorcycles, and vehicles stored long term. When riding/driving and charging, the LED is steady green. 30 seconds after charging stops (i.e. the vehicle is parked), the unit will enter low current mode to show battery status while the vehicle is in storage. The LED will blink green, yellow or red to show stored state battery condition. An added benefit is that LED blinking looks like a vehicle alarm. This mode has only a very small current draw (0.5mA) from battery. This is similar to mode (2) but the LED is not illuminated under normal charging conditions. That is, the LED is blank in normal operation. Yellow and red illuminations signal charging faults or discharging battery. This mode is a high resolution mode where maximum resolution is important and colour changes and flashing are not distracting. This mode monitors 10 different voltage ranges from 10.5 to 15+ volts. This mode uses a simple low current (less than 0.5mA), three colour battery status monitoring. A short flash every 2 seconds indicates current state, with 5 different voltage ranges from 10.5 to 15+ volts. This diagram shows the different map modes. The tricks of the device don’t end with the different maps. 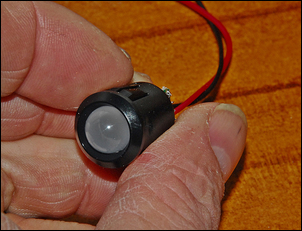 You can also configure the LED to work on battery voltages of 6, 12 or 24 volts! So is it all good news? Well, we initially found the instructions rather hard to understand - especially in the area of mode set-up. Let’s take a look at this aspect. Now here is the trickier bit. To confirm what mode you have now set, turn off power and then re-connect it. In this case you would expect to see three green flashes (indicates the LED is still in its 12V battery monitoring setting), a pause, and then green flashes (indicates Map 2). This little unit is ideal for battery monitoring in cars (especially those driven irregularly), motorcycles, 6V and 12V portable battery powered equipment – you name it, if it has a 6V, 12V or 24V battery, this programmable monitor will probably suit. It is also ideal for camping and remote area power supply systems running off battery or solar power. The unit costs, at the time of writing, just under AUD$15 (plus $2.30 postage to Australia). It is made by Gammatronix in the UK and is available from that country via eBay. Search for ‘6v, 12v, 24v Programmable LED Battery level voltage monitor meter indicator’. Personally, we can immediately think of three uses for this great device. We have a car that is driven rarely – so we’re going to install the LED set to 12V mode, Map 3. That will check the battery is being properly charged when the vehicle is being driven, allow us to quickly assess battery voltage at a glance during storage, and will as a bonus act as a dummy alarm. 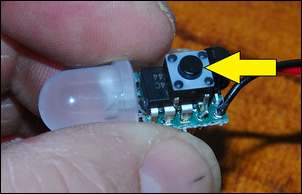 We’re currently modifying a Dolphin LED 6V torch. The ‘lantern’ battery (an alkaline design) actually cost nearly as much as the torch, so it would be great to have an inbuilt battery monitor that works only when the torch is switched on – just wire-in the LED in 6V mode, Map 6. 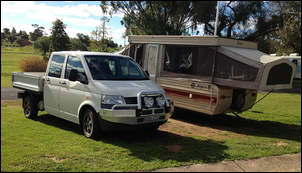 Finally, we’re been going camping recently with 12V lamps being driven from the car battery. But there is always a nagging thought – how low is the car battery getting? 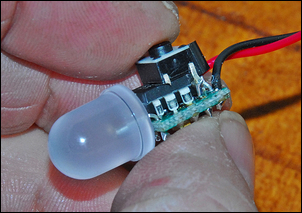 Easy - just wire-in the LED in 12V mode, Map 6, installing it in one of the camping lights. The programmable LED Battery level voltage monitor was purchased for this story.